When it comes time to replace their old, outdated roofing system, many homeowners face a plethora of material choices to protect their home for the years to come. Each style provides its own unique blend of positives, negatives, and total costs. Based on your house’s style and needs, you can find the perfect material for long-term protection. If your Kentucky roof is looking worse for the wear, our local roofing company can help! HCI Roofing and Construction is proud to be Louisville’s roofing contractors, providing a comprehensive approach for your home’s roof, gutters, railings, doors, and more. For years, our experienced roofing contractors have helped homeowners across Kentucky with effective, affordable solutions that meet your unique needs and budget. As a team of your Top Rated Local® roofing contractors, HCI is here and ready to provide assistance in any fashion we can. Today, we’ll look into the benefits and drawbacks of rubber roofing. While relatively unknown, this versatile material has helped to keep roofs with low slopes. When done, be sure to reach out to our roofing company in Louisville for a quote on your home’s roofing needs, from repairs to full replacements. Ethylene propylene diene terpolymer (EPDM) roofing is an elastomeric compound that is created to provide a wide range of benefits for business owners and homeowners alike. Instead of costly materials and extensive installation processes, EPDM consists of a sheet of rubber that is properly fastened and installed for long-term use. Below are a few benefits you can expect when utilizing EPDM for your home. The overall cost of installing a new rubber roof on your structure can end up being very cost-effective. A licensed roofing company will need to complete the installation, but the lightweight composition and convenient style of EPDM makes it fairly quick and easy to install. This cost in labor and complex materials will save you money in addition to the rubber’s overall affordability. Generally, the cost of an EPDM roof will run between $2.50 and $5.00 per square foot. Overall, rubber roofing systems can prove to be more cost-friendly on every front. When your traditional roof starts to leak, major problems can develop. One of the biggest concerns with any roofing repair service is the cost to fix all of the issues that are present. With EPDM roofs, fixing leaks is often fast and very inexpensive. Our roofing repair experts can fix leaks with liquid rubber or specialty tape, making the repair process as pain-free as possible. It’s important to remember that EPDM roofing is very durable, reducing the need for repairs drastically throughout the lifetime of the product. Any repairs that are needed — such as re-attaching sections of the membrane that have come loose — will be fast and easy, saving you money in the long term in addition to up front. EPDM roofing can prove to be a smart, economical choice for flatter roofs. If your home is more level than steep, this rubber membrane may be a smart material for replacement. Next time, we’ll continue this topic by discussing more benefits and a few drawbacks of EPDM for business and residential applications. 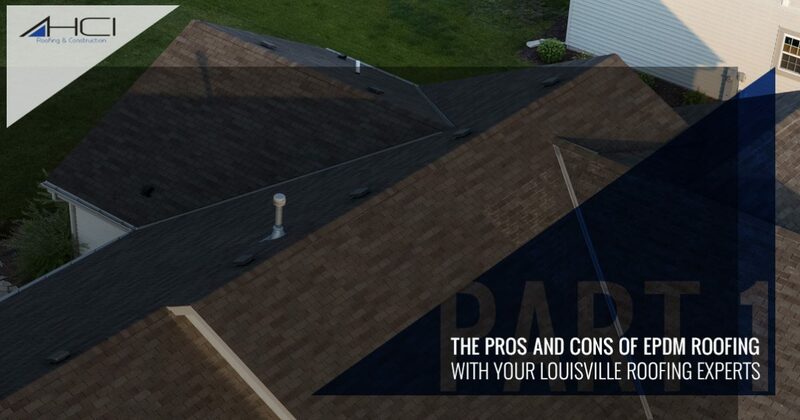 If you’re in need of Louisville roofing services, be sure to contact our contractors for assistance!